Practical Blogging – Page 3 – Helping bloggers and webmasters increase their income via Adsense, Affiliate Advertising and General Blogging Help. I’m trying out a new ad service which places links in my blog. Triggit‘s Robert Dunn pinged me a while back and asked me to take a look, so if you have any feedback on the service, please let me know. Gooncity, a pixel art project. No, I didn’t go to BarCamp London but I noticed that Slideshare was featuring their presos in the header. Glancing through a few of the topics, I was intrigued by the Moo API preso. It’s a great ‘sharing’ preso, because I don’t really need to hear the person talking to get the bulk of the info. I initially clicked because I love Moo, but the preso was a great way to really show off what their API does and how easy it is to get it working for you. Very cool! I'm totally taking part. Don't worry, I'll be hard to miss. I'll be the lone republican californian on twitter making my voice heard 🙂 @Duzins is my handle. This of course assumes the debates go on and our economy doesn't end up in the loo. Nintendo is using YouTube in a very unique way to promote WarioLand and the Wii. As he bursts through blocks and rocks his way through tunnels, the actual page layout of the YouTube site falls apart piece by piece. Innovative, interesting but unfortunately not quite perfect. Rules of good word of mouth marketing are simple, and they ALWAYS include a sharing feature. Normally on YouTube I can share via embed, url or email. Obviously I see why embed won’t work, but the other sharing features are important. Viral stuff spreads easier with actual mechanisms that encourage virality. So, I grade this one at 85%. Sad, because it’s so close to 100%. 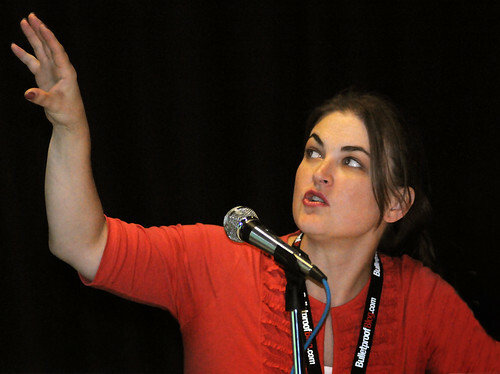 Brad Crooks took this pic of me at one of my panels on Sunday at BlogWorld Expo. I look like I’m in the Thriller video! Wow. Serious innovation. Perhaps this kid should be on the green team (a position I think will end up in either president's cabinet).